Exquisite villa, with panoramic views, and pool. It is beautifully furnished with french provincial furniture, orthopedic beds, embroidered sheets. Attention to detail has been spend on this villa, in order to make your holiday comfortable and luxurious. The views are breathtaking, the pool situated in a wonderful garden. If you are looking for total relaxation this is the villa that will meet all your needs. It is situated in the village of Lakithra, and is close to the best beaches of Kefalonia. We also provide homemade gourmet meals as a optional extra which may be delivered to your villa on any day you choose. We also offer services such as massages, pedicures, and manicures, also baby sitting services from experienced and professionally trained baby sitters. and one must not forget to mention our wonderful picnic basket that we can prepare. It is truly a home away from home. 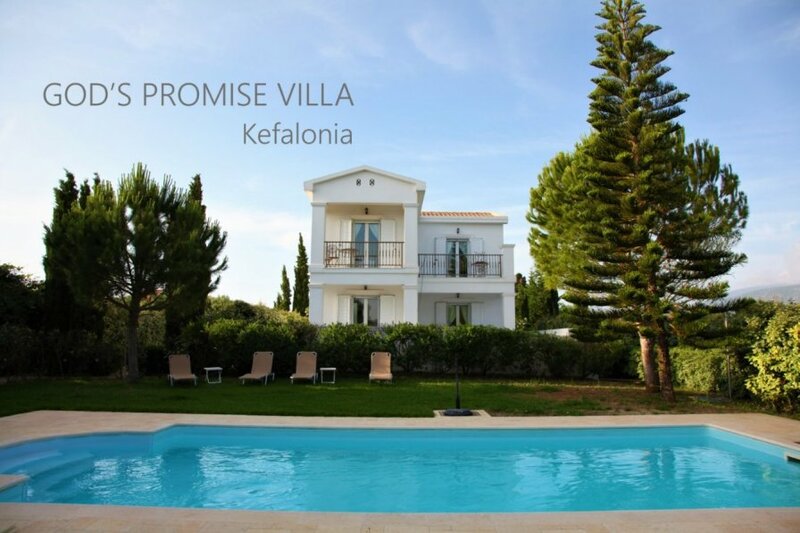 Gods Promise Villa is a exquisite beautifully built independent villa with private pool. It is located at the southern part of the island and set in 8 acres of an olive grove up on the hill. Situated at the picturesque village of Lakithra, one of the upmarket beautiful villages of Kefalonia. The views, are breathtaking which combine magnificent sea views, to the island of Zakynthos and mountain views at Mount Aenos. Literally 360 degree views...every part of this villa has a view. Gods Promise Villa is five star accommodation at its best. It is ideal accommodation for a family, a couple, or a group of friends. One can relax within the magnificent gardens enjoying the sea view, and swimming in the private sparkling pool. But one must not omit to say that the best beaches of Kefalonia are 3 minutes away such as, Ai-helis, Ammes, Avithos and many others! It would be our pleasure to accommodate you and we would do our best to make your holiday the best ever.